The long-term goal of the project is to develop and analyse methods for the recognition of specific nano-objects by analysing data-intensive, noisy, and artefact afflicted image sequences from sensor systems, which are subject to several aggravating influences. A challenge is that the processing of the image sequences should be done in (soft) real-time while minimising resource consumption, e.g., of energy and memory. Therefore, multi-objective optimisation is an important topic of our research. Amongst other objectives, we optimise hardware efficiency, time efficiency, and detection quality regarding varying demands. At the centre of attention are the detection and quantification of biological nanoparticles with the plasmon assisted microscopy of nano-sized objects (PAMONO) sensor. Topics of consideration include aspects of technological development and biophysical methods for nano-object detection in vital, real-life scenarios. Based on the experience from the project, we aim to develop methods and technical concepts with respect to robustness and applicability to identify the most feasible methods for fast, user-friendly sensor software adaptation in the field of quality control of medicinal products. This should be achieved in collaboration with the application partners ARTES Biotechnology GmbH (ARTES) and Paul-Ehrlich-Institut (PEI). They are involved in the methodological development and especially responsible for the subsequent commercial aspects of the PAMONO sensor in fields of quality control in the production of vaccines (ARTES) and quality control of blood donations and blood products (PEI). A challenge is to adapt to altering environmental conditions and thus to increasingly diverse characteristics of images. For this purpose, we want to examine methods that increase adaptivity of deep feature learning approaches and develop highly specialised, efficient architectures for DNNs (differentiable programming). At the technical level, we will focus on the development of novel approaches for PAMONO sensor surface functionalisation and of an innovative, adaptive biosensor/actuator unit based on the PAMONO sensor. Therefore, algorithmic solutions for automatic adjustment of the involved actuators and automatic monitoring of the PAMONO unit sensor behaviour are needed. As a result of the project, we want to achieve a methodical and technical solution that allows for using the PAMONO technology for medicinal product quality control. Fey/Lenssen/2019a Fey, Matthias and Lenssen, Jan Eric. Fast Graph Representation Learning with PyTorch Geometric. In ICLR Workshop on Representation Learning on Graphs and Manifolds, 2019. Chen/etal/2018a Chen, Kuan-Hsun and von der Brueggen, Georg and Chen, Jian-Jia. Analysis of Deadline Miss Rates for Uniprocessor Fixed-Priority Scheduling. In 24th IEEE International Conference on Embedded and Real-Time Computing Systems and Applications (RTCSA), Hakodate, Japan, 2018. Chen/etal/2018b Chen, Jian-Jia and Nelissen, Geoffrey and Huang, Wen-Hung and Yang, Maolin and Brandenburg, Bjoern and Bletsas, Konstantinos and Liu, Cong and Richard, Pascal and Ridouard, Frederic and Audsley, Neil and Rajkumar, Raj and Niz, Dionisio and von der Brueggen, Georg. Many suspensions, many problems: a review of self-suspending tasks in real-time systems. In Real-Time Systems, 2018. Dong/Liu/2018a Dong, Zheng and Liu, Cong and Bateni, Soroush and Chen, Kuan-Hsun and Chen, Jian-Jia and von der Brüggen, Georg and Shi, Junjie. Shared-Resource-Centric Limited Preemptive Scheduling: A Comprehensive Study of Suspension-base Partitioning Approaches. In Proceedings of the 24th IEEE Real-Time and Embedded Technology and Applications Symposium, 2018. Fey/etal/2017a Fey, Matthias and Lenssen, Jan Eric and Weichert, Frank and Müller, Heinrich. SplineCNN: Fast Geometric Deep Learning with Continuous B-Spline Kernels. In IEEE Conference on Computer Vision and Pattern Recognition (CVPR), 2018. Kriege/etal/2018c Kriege, Nils and Fey, Matthias and Fisseler, Denis and Mutzel, Petra and Weichert, Frank. Recognizing Cuneiform Signs Using Graph Based Methods. In International Workshop on Cost-Sensitive Learning (COST), SIAM International Conference on Data Mining (SDM), 2018. Lenssen/etal/2018a Lenssen, Jan Eric and Toma, Anas and Seebold, Albert and Shpacovitch, Victoria and Libuschewski, Pascal and Weichert, Frank and Chen, Jian-Jia and Hergenröder, Roland. Real-Time Low SNR Signal Processing for Nanoparticle Analysis with Deep Neural Networks. In International Conference on Bio-inspired Systems and Signal Processing (BIOSIGNALS), INSTICC, SciTePress, 2018. Lenssen/etal/2018b Lenssen, Jan Eric and Fey, Matthias and Libuschewski, Pascal. Group Equivariant Capsule Networks. In Advances in Neural Information Processing Systems (NIPS), to appear, 2018. Toma/etal/2018a Toma, Anas and Starinow, Alexander and Lenssen, Jan Eric and Chen, Jian-Jia. Saving Energy for Cloud Applications in Mobile Devices using Nearby Resources. In the 26th Euromicro International Conference on Parallel, Distributed and Network-based Processing (PDP 2018), Cambridge, UK, 2018. Ueter/etal/2018a Ueter, Niklas and von der Brueggen, Georg and Chen, Jian-Jia and Li, Jing and Agrowal, Kunal. Reservation-Based Federated Scheduling for Parallel Real-Time Tasks. In IEEE Real-Time Systems Symposium (RTSS), 2018. VonDerBrueggen/etal/2018a von der Brüggen, Georg and Piatkowski, Nico and Chen, Kuan-Hsun and Chen, Jian-Jia and Morik, Katharina. Efficiently Approximating the Probability of Deadline Misses in Real-Time Systems. In 30th Euromicro Conference on Real-Time Systems, ECRTS 2018, July 3-6, 2018, Barcelona, Spain, LIPIcs, 2018. Yayla/etal/2018a Yayla, Mikail and Chen, Kuan-Hsun and Chen, Jian-Jia. Fault Tolerance on Control Applications: Empirical Investigations of Impacts from Incorrect Calculations. In 4th Workshop on Emerging Ideas and Trends in Engineering of Cyber-Physical Systems (EITEC), 2018. Brueggen/Chen/2017a von der Brüggen, Georg and Chen, Jian-Jia and Huang, Wen-Hung and Yang, Maolin. Release Enforcement in Resource-Oriented Partitioned Scheduling for Multiprocessor Systems. In International Conference on Real-Time Networks and Systems (RTNS), 2017. Brueggen/etal/2016a von der Brüggen, Georg and Chen, Jian-Jia and Davis, Robert I. and Huang, Wen-Hung Kevin. Exact Speedup Factors for Linear-Time Schedulability Tests for Fixed-Priority Preemptive and Non-preemptive Scheduling. In Information Processing Letters (IPL), Vol. 117, pages 1-5, 2017. Brueggen/Huang/2017a von der Brüggen, Georg and Huang, Wen-Hung and Chen, Jian-Jia. Hybrid self-suspension models in real-time embedded systems. In 23rd IEEE International Conference on Embedded and Real-Time Computing Systems and Applications, RTCSA, pages 1--9, IEEE, 2017. Chen/Brandenburg/2016a Chen, Jian-Jia and Brandenburg, Bjoern. A Note on the Period Enforcer Algorithm for Self-Suspending Tasks. Vol. 4, No. 1, pages 01:1--01:22, 2017. Chen/Brueggen/2017a Chen, Jian-Jia and von der Brüggen, Georg and Huang, Wen-Hung and Davis, Robert I. On the Pitfalls of Resource Augmentation Factors and Utilization Bounds in Real-Time Scheduling. In 29th Euromicro Conference on Real-Time Systems (ECRTS), pages 9:1--9:25, 2017. Chen/Brueggen/2017b Chen, Jian-Jia and von der Brüggen, Georg and Huang, Wen-Hung and Liu, Cong. State of the art for scheduling and analyzing self-suspending sporadic real-time tasks. In 23rd IEEE International Conference on Embedded and Real-Time Computing Systems and Applications (RTCSA), pages 1--10, IEEE, 2017. Chen/Chen/2017a Chen, Kuan-Hsun and Chen, Jian-Jia. Probabilistic schedulability tests for uniprocessor fixed-priority scheduling under soft errors. In 12th IEEE International Symposium on Industrial Embedded Systems (SIES), pages 1--8, 2017. Chen/etal/2016d Chen, Jian-Jia and Nelissen, Geoffrey and Huang, Wen-Hung and Yang, Maolin and Brandenburg, Bjoern and Bletsas, Konstantinos and Liu, Cong and Richard, Pascal and Ridouard, Frederic and Audsley, Neil and Rajkumar, Raj and Niz, Dionisio. Many Suspensions, Many Problems: A Review of Self-Suspending Tasks in Real-Time Systems. No. 1, Department of Computer Science, TU Dortmund, 2017. Chen/Huang/2017a Chen, Jian-Jia and Huang, Wen-Hung and Dong, Zheng and Liu, Cong. Fixed-priority scheduling of mixed soft and hare real-time tasks on multiprocessors. In 23rd IEEE International Conference on Embedded and Real-Time Computing Systems and Applications (RTCSA), pages 1--10, 2017. Cheng/Chen/2017a Cheng, Sheng-Wei and Chen, Jian-Jia and Reineke, Jan and Kuo, Tei-Wei. Memory Bank Partitioning for Fixed-Priority Tasks in a Multi-Core System. In IEEE Real-Time Systems Symposium (RTSS), 2017. Lenssen/etal/2017a Lenssen, Jan Eric and Shpacovitch, Victoria and Weichert, Frank. Real-Time Virus Size Classification Using Surface Plasmon PAMONO Resonance and Convolutional Neural Networks. In Bildverarbeitung für die Medizin 2017, pages 98--103, 2017. Lenssen/etal/2017b Lenssen, Jan Eric and Shpacovitch, Victoria and Siedhoff, Dominic and Libuschewski, Pascal and Hergenröder, Roland and Weichert, Frank. A Review of Nano-Particle Analysis with the PAMONO-Sensor. In Biosensors: Advances and Reviews, pages 81--100, IFSA Publishing, 2017. Pagani/Khdr/2017a Pagani, Santiago and Khdr, Heba and Chen, Jian-Jia and Shafique, Muhammad and Li, Minming and Henkel, Joerg. Thermal Safe Power (TSP): Efficient Power Budgeting for Heterogeneous Manycore Systems in Dark Silicon. In IEEE Transactions on Computers, Vol. 66, No. 1, pages 147 - 162, 2017. Shpacovitch/Hergenroeder/2017a Shpacovitch, Victoria and Hergenröder, Roland. Optical and surface plasmonic approaches to characterize extracellular vesicles. A review. In Analytica Chimica Acta, Vol. 1005, pages 1-15, 2017. Siedhoff/etal/2017a Siedhoff, Dominic and Strauch, Martin and Shpacovitch, Victoria and Merhof, Dorit. Unsupervised Data Analysis for Virus Detection with a Surface Plasmon Resonance Sensor. In International Conference on Image Processing Theory, Tools and Applications (IPTA 2017), 2017. Yang/Chen/2017a Yang, Maolin and Chen, Jian-Jia and Huang, Wen-Hung. A misconception in blocking time analyses under multiprocessor synchronization protocols. In Real-Time Systems, Vol. 53, No. 2, pages 187-195, 2017. Zybin/etal/2017a Zybin, A. and Shpacovitch, V. and Skolnik, J. and Hergenröder, R.. Optimal conditions for SPR-imaging of nano-objects. In Sensors and Actuators B: Chemical, Vol. 239, pages 338--342, 2017. Chen/2016a Chen, Jian-Jia. Computational Complexity and Speedup Factors Analyses for Self-Suspending Tasks. In Real-Time Systems Symposium (RTSS), Porto, Portugal, 2016. Chen/2016b Chen, Jian-Jia. Partitioned Multiprocessor Fixed-Priority Scheduling of Sporadic Real-Time Tasks. In Euromicro Conference on Real-Time Systems (ECRTS), Toulouse, France, 2016. Chen/2016c Chen, Jian-Jia. Federated Scheduling Admits No Constant Speedup Factors for Constrained-Deadline DAG Task Systems. In Real-Time Systems, 2016. Chen/etal/2016a Cheng, Sheng-Wei and Chang, Che-Wei and Chen, Jian-Jia and Kuo, Tei-Wei and Hsiu, Pi-Cheng. Many-Core Real-Time Task Scheduling with Scratchpad Memory. In IEEE Transactions on Parallel and Distributed Systems., 2016. Chen/etal/2016c Chen, Jian-Jia and Huang, Wen-Hung and Liu, Cong. k2Q: A Quadratic-Form Response Time and Schedulability Analysis Framework for Utilization-Based Analysis. In Real-Time Systems Symposium (RTSS), Porto, Portugal, 2016.
chen/etal/2016f Chen, Jian-Jia and Nelissen, Geoffrey and Huang, Wen-Hung Kevin. A Unifying Response Time Analysis Framework for Dynamic Self-Suspending Tasks. In Euromicro Conference on Real-Time Systems (ECRTS), Toulouse, France, 2016. Huang/Chen/2016a Huang, Wen-Hung and Chen, Jian-Jia. Self-Suspension Real-Time Tasks under Fixed-Relative-Deadline Fixed-Priority Scheduling. In Design, Automation and Test in Europe (DATE), Dresden, Germany, 2016. Huang/Chen/2016b Huang, Wen-Hung and Chen, Jian-Jia. Utilization Bounds on Allocating Rate-Monotonic Scheduled Multi-Mode Tasks on Multiprocessor Systems. In Design Automation Conference (DAC), Austin, TX, USA, 2016. Huang/etal/2016a Huang, Wen-Hung and Chen, Jian-Jia and Reineke, Jan. MIRROR: Symmetric Timing Analysis for Real-Time Tasks on Multicore Platforms with Shared Resources. In Design Automation Conference (DAC), Austin, TX, USA, ACM, 2016. Huang/etal/2016b Huang, Wen-Hung and Yang, Maolin and Chen, Jian-Jia. Resource-Oriented Partitioned Scheduling in Multiprocessor Systems: How to Partition and How to Share?. In Real-Time Systems Symposium (RTSS), Porto, Portugal, 2016. Neugebauer/2016a Neugebauer, Olaf and Engel, Michael and Marwedel, Peter. A parallelization approach for resource-restricted embedded heterogeneous MPSoCs inspired by OpenMP. In Journal of Systems and Software, 2016. Toma/etal/2016b Toma, Anas and Pagani, Santiago and Chen, Jian-Jia and Karl, Wolfgang and Henkel, Jörg. An Energy-Efficient Middleware for Computation Offloading in Real-Time Embedded Systems. In the 22th IEEE International Conference on Embedded and Real-Time Computing Systems and Applications (RTCSA 2016), Daegu, South Korea, 2016. Brueggen/etal/2015a von der Brüggen, Georg and Chen, Jian-Jia and Huang, Wen-Hung. Schedulability and Optimization Analysis for Non-Preemptive Static Priority Scheduling Based on Task Utilization and Blocking Factors. In Euromicro Conference on Real-Time Systems (ECRTS) 2015, IEEE, 2015. Chen/etal/2015a Chen, Jian-Jia and Huang, Wen-Hung and Liu, Cong. k2U: A General Framework from k-Point Effective Schedulability Analysis to Utilization-Based Tests. In Real-Time Systems Symposium (RTSS), 2015. Huang/etal/2015b Huang, Wen-Hung and Chen, Jian-Jia and Zhou, Husheng and Liu, Cong. PASS: Priority Assignment of Real-Time Tasks with Dynamic Suspending Behavior under Fixed-Priority Scheduling. In Design Automation Conference (DAC), 2015. Neugebauer/etal/2015a Neugebauer, Olaf and Libuschewski, Pascal and Engel, Michael and Müller, Heinrich and Marwedel, Peter. Plasmon-based Virus Detection on Heterogeneous Embedded Systems. In Proceedings of the 18th International Workshop on Software and Compilers for Embedded Systems, pages 48-57, New York, NY, USA, ACM, 2015. Shpacovitch/etal/2015a Shpacovitch, Victoria and Temchura, Vladimir and Matrosovich, Mikhail and Hamacher, Joachim and Skolnik, Julia and Libuschewski, Pascal and Siedhoff, Dominic and Weichert, Frank and Marwedel, Peter and Müller, Heinrich and Überla, Klaus and Hergenröder, Roland and Zybin, Alexander. Application of Surface Plasmon Resonance Imaging Technique for the Detection of Single Spherical Biological Submicron-particles. In Analytical Biochemistry: Methods in the Biological Sciences, 2015. WenHung/Chen/2015a Huang, Wen-Hung and Chen, Jian-Jia. Techniques for Schedulability Analysis in Mode Change Systems under Fixed-Priority Scheduling. In IEEE International Conference on Embedded and Real-Time Computing Systems and Applications, Hong Kong, 2015. Chen/Liu/2014b Chen, Jian-Jia and Liu, Cong. Fixed-Relative-Deadline Scheduling of Hard Real-Time Tasks with Self-Suspensions. In Real-Time Systems Symposium (RTSS), 2014 IEEE, pages 149--160, IEEE, 2014. Libuschewski/etal/2014b Libuschewski, Pascal and Marwedel, Peter and Siedhoff, Dominic and Müller, Heinrich. Multi-Objective Energy-Aware GPGPU Design Space Exploration for Medical or Industrial Applications. In IEEE Computer Society (editors), Signal-Image Technology and Internet-Based Systems (SITIS), 2014 Tenth International Conference on, pages 637-644, IEEE Computer Society, 2014. Libuschewski/etal/2014c Libuschewski, Pascal and Siedhoff, Dominic and Weichert, Frank. Energy-aware Design Space Exploration for GPGPUs. In Computer Science - Research and Development, pages 1-6, 2014. Liu/Chen/2014a Liu, Cong and Chen, Jian-Jia. Bursty-interference analysis techniques for analyzing complex real-time task models. In Real-Time Systems Symposium (RTSS), 2014 IEEE, pages 173--183, IEEE, 2014. Shpacovitch/etal/2014a Shpacovitch, Victoria and Temchura, Vladimir and Libuschewski, Pascal and Siedhoff, Dominic and Weichert, Frank and Überla, Klaus and Zybin, Alexander. Application of surface plasmon resonance technique (SPR nanoscopy) for the specific detection of single biological nano-particles.. In XII Conference on Optical Chemical Sensors and Biosensors 13-16 April 2014, 2014. Siedhoff/etal/2014a Siedhoff, Dominic and Libuschewski, Pascal and Weichert, Frank and Zybin, Alexander and Marwedel, Peter and Müller, Heinrich. Modellierung und Optimierung eines Biosensors zur Detektion viraler Strukturen. In Bildverarbeitung für die Medizin 2014, pages 108--113, Springer, 2014. Siedhoff/etal/2014b Siedhoff, Dominic and Fichtenberger, Hendrik and Libuschewski, Pascal and Weichert, Frank and Sohler, Christian and Müller, Heinrich. Signal/Background Classification of Time Series for Biological Virus Detection. In Xiaoyi Jiang, Joachim Hornegger, Reinhard Koch (editors), Pattern Recognition - 36th German Conference, GCPR 2014, Münster, Germany, September 2-5, 2014. Proceedings, Springer, 2014. 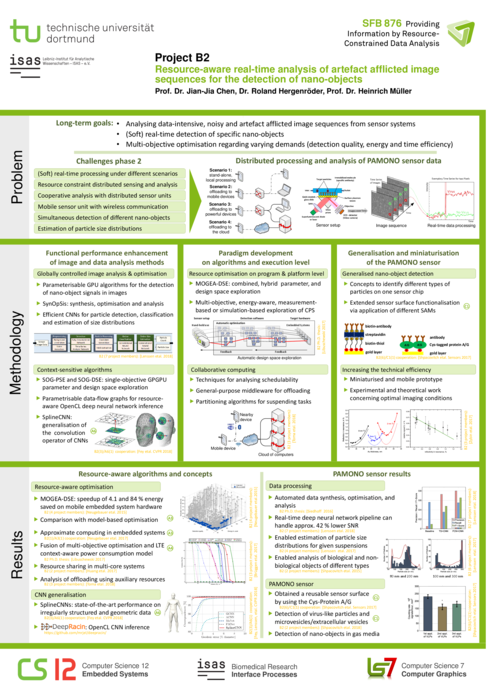 Feld/etal/2013a Feld, Micha and Shpacovitch, Victoria and Christina, Ehrhardt and Fastrich, Michaela and Goerge, Tobias and Ludwig, Stephan and Steinhoff, Martin. Proteinase-Activated Receptor-2 Agonist Activates Anti-Influenza Mechanisms and Modulates IFNgamma-Induced Antiviral Pathways in Human Neutrophils. In BioMed Research International, 2013. Libuschewski/etal/2013a Libuschewski, Pascal and Siedhoff, Dominic and Timm, Constantin and Weichert, Frank. Mobile Detektion viraler Pathogene durch echtzeitfähige GPGPU-Fuzzy-Segmentierung. In Bildverarbeitung für die Medizin 2013, pages 326-331, Springer, 2013. Libuschewski/etal/2013b Libuschewski, Pascal and Siedhoff, Dominic and Timm, Constantin and Gelenberg, Andrej and Weichert, Frank. Fuzzy-enhanced, Real-time capable Detection of Biological Viruses Using a Portable Biosensor. In Proceedings of the International Joint Conference on Biomedical Engineering Systems and Technologies (BIOSIGNALS), pages 169-174, 2013. Shpacovitch/etal/2013a Shpacovitch, Victoria and Temchura, Vladimir and Überla, Klaus and Zybin, Alexander. Application of Surface Plasmone Resonance Imaging (SPRi) for the Selective Detection of single HIV-Virus-like Particles (HIV-VLPs). In 8th Deutsches BioSensor Symposium (DBS 2013), March 10-13th, 2013, (oral presentation), 2013. Shpacovitch/etal/2013b Shpacovitch, Victoria and Temchura, Vladimir and Matrosovich, Mikhail and Überla, Klaus and Zybin, Alexander. Application of Surface Plasmon Resonance Imaging (SPRi) for the Detection of single Viruses and Virus-like Particles (VLPs). In 5th European Congress of Virology, September 11-14th, 2013 (oral presentation), 2013. Shpacovitch/etal/2013c Shpacovitch, Victoria and Temchura, Vladimir and Libuschewski, Pascal and Siedhoff, Dominic and Weichert, Frank and Matrosovich, Mikhail and Überla, Klaus and Zybin, Alexander. Use of the Surface Plasmon Resonance Technique for specific Detection of single Biological Nano-Objects. 2013. Siedhoff/etal/2013a Siedhoff, Dominic and Libuschewski, Pascal and Weichert, Frank. Knowledge Extraction and Application in Biosensor Data Analysis. In Poster Presentation at IK 2013, 2013. Jovanovic/etal/2012a Jovanovic, Olivera and Marwedel, Peter and Bacivarov, Iuliana and Thiele, Lothar. MAMOT: Memory-Aware Mapping Optimization Tool for MPSoC. In 15th Euromicro Conference on Digital System Design (DSD 2012), Izmir, Turkey, 2012. Jovanovic/etal/2012b Jovanovic, Olivera and Kneuper, Nils and Marwedel, Peter and Engel, Michael. ILP-based Memory-Aware Mapping Optimization for MPSoCs. In The 10th IEEE/IFIP International Conference on Embedded and Ubiquitous Computing, Paphos, Cyprus, 2012. Libuschewski/etal/2012a Libuschewski, Pascal and Timm, Constantin and Weichert, Frank. Parameteroptimierte und GPGPU-basierte Detektion viraler Strukturen innerhalb Plasmonen-unterstützter Mikroskopiedaten. In Bildverarbeitung für die Medizin 2012, pages 237--242, Berlin, Germany; Heidelberg, Germany, Springer, 2012. Shpacovitch/2012a Shpacovitch, Victoria. Application of Surface Plasmon Resonance (SPR) for the detection of single viruses and single biological nano-objects. In Journal of Bacteriology and Parasitology, Vol. 3, No. 7, pages 1-3, 2012. Shpacovitch/2012b Shpacovitch, Victoria. Interferons, Serine Proteases and Protease-activated receptors: Enemies or Partners?. In Joe H. Thomas, Adrian Roberts (editors), Interferons: Characterirization, Mechanism of Action and Clinical Application, pages 95-105, Nova Publishers, 2012. Timm/etal/2012a Timm, Constantin and Görlich, Markus and Weichert, Frank and Marwedel, Peter and Müller, Heinrich. Feedback-Based Global Instruction Scheduling for GPGPU Applications. In 12th International Conference Computational Science and Its Applications 2012 (ICCSA), pages 15-28, 2012. Zybin/etal/2012a Zybin and Alexander, Shpacovitch and Victoria, Gurevich and Evgeney, Temchura and Vladimir, Überla and Klaus. Selective detection of single viral particles in aqueous solution by plasmon assisted nanoscopy. (poster presentation at Jahrestagung der Gesellschaft für Virologie, Essen). 2012. Gurevich/etal/2011a Gurevich, Evgeny L. and Temchura, Vladimir and Überla, Klaus and Zybin, Alexander. Analytical Features of Particle Counting Sensor based on Plasmon assisted Microscopy of Nano Objects. In Sensors and Actuators B: Chemical, Vol. B 160, No. 1, pages 1210 - 1215, 2011. Siedhoff/etal/2011a Siedhoff, Dominic and Weichert, Frank and Libuschewski, Pascal and Timm, Constantin. Detection and Classification of Nano-Objects in Biosensor Data. In Microscopic Image Analysis with Applications in Biology, 2011. Timm/etal/2011a Timm, Constantin and Libuschewski, Pascal and Siedhoff, Dominic and Weichert, Frank and Müller, Heinrich and Marwedel, Peter. Improving Nanoobject Detection in Optical Biosensor Data. In Callaos, N. et al (editors), Proceedings of the 15th World Multi-Conference on Systemics, Cybernetics and Informatics: WMSCI 2011, Vol. II, pages 236-240, Orlando, Florida, USA, IIIS, 2011. Timm/etal/2011b Timm, Constantin and Weichert, Frank and Müller, Heinrich and Marwedel, Peter. Multi-Objective Local Instruction Scheduling for GPGPU Applications. In IASTED International Conference on Parallel and Distributed Computing and Systems, PDCS 2011, 2011. Timm/Weichert/2011a Timm, Constantin and Weichert, Frank and Marwedel, Peter and Müller, Heinrich. Design Space Exploration Towards a Realtime and Energy-Aware GPGPU-based Analysis of Biosensor Data. In Computer Science - Research and Development (CSRD), 27(4), pages 309-317, 2011. Weichert/etal/2011a Weichert, Frank and Timm, Constantin and Gaspar, Marcel and Zybin, Alexander and Gurevich, Evgeny L. and Müller, Heinrich and Marwedel, Peter. GPGPU-basierte Echtzeitdetektion von Nanoobjekten mittels Plasmonen-unterstützter Mikroskopie. In Bildverarbeitung für die Medizin 2011, pages 39--43, Berlin, Germany; Heidelberg, Germany, Springer, 2011. Huang/etal/2016b - Resource-Oriented Partitioned Scheduling in Multiprocessor Systems: How to Partition and How to Share? Shpacovitch/etal/2014a - Application of surface plasmon resonance technique (SPR nanoscopy) for the specific detection of single biological nano-particles. Shpacovitch/2012b - Interferons, Serine Proteases and Protease-activated receptors: Enemies or Partners? Huang/2017a Huang, Wen-Hung. Scheduling Algorithms and Timing Analysis for Hard Real-Time Systems. TU Dortmund, 2017. Libuschewski/2017a Libuschewski, Pascal. 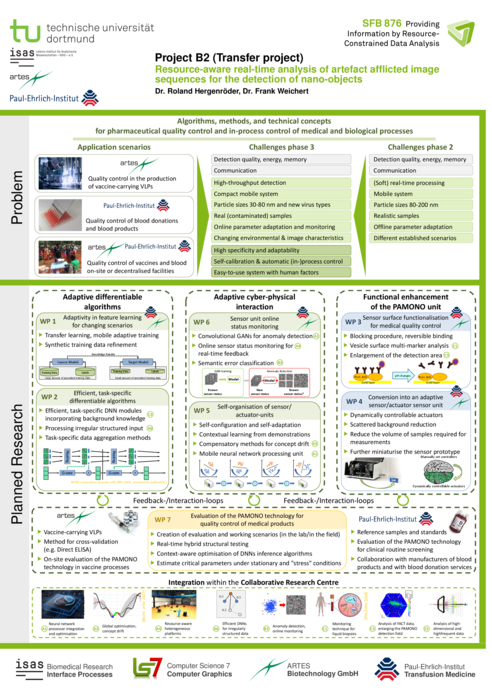 Exploration of Cyber-Physical Systems for GPGPU Computer Vision-Based Detection of Biological Viruses. TU Dortmund, Dortmund, Germany, Department of Computer Science, 2017. Siedhoff/2016a Siedhoff, Dominic. A Parameter-Optimizing Model-Based Approach to the Analysis of Low-SNR Image Sequences for Biological Virus Detection. TU Dortmund, Dortmund, Germany, Department of Computer Science, 2016. Timm/2012a Timm, Constantin. Resource Efficient Processing and Communication in Sensor/Actuator Environments. TU Dortmund, Dortmund, Germany, Department of Computer Science, 2012. Baack/2013a Baack, Dominik. Modellbasierte Identifikation und Analyse zeitabhängiger FACT-Daten. TU Dortmund, 2013. Bublitz/2012a Bublitz, Wolf. Hoch parallele multiskalierte Tiefpassfilterung zur Rauschreduktion in Bilddatenfolgen. TU Dortmund, Lehrstuhl für Graphische Systeme, 2012. Pyka/etal/2010a Pyka, Robert and Klein, Felipe and Marwedel,Peter and Mamagkakis, Stylianos. Versatile System-Level Memory-Aware Platform Description Approach	for Embedded MPSoCs. In Proc. of the ACM SIGPLAN/SIGBED 2010 Conference on Languages, Compilers,	and Tools for Embedded Systems, pages 9-16, ACM, 2010. Timm/etal/2010a Timm, Constantin and Gelenberg, Andrej and Weichert, Frank and Marwedel, Peter. Reducing the Energy Consumption of Embedded Systems by Integrating General Purpose GPUs. No. 829, Technische Universität Dortmund, Fakultät für Informatik, 2010. Timm/etal/2010b Timm, Constantin and Gelenberg, Andrej and Marwedel, Peter and Weichert, Frank. Energy Considerations within the Integration of General Purpose GPUs in Embedded Systems. In Proc. of the Annual International Conference on Advances in Distributed and Parallel Computing (ADPC 2010), 2010. Weichert/etal/2010a Weichert, Frank and Gaspar, Marcel and Timm, Constantin and Zybin, Alexander and Gurevich, Evgeny and Engel, Michael and Müller, Heinrich and Marwedel, Peter. Signal Analysis and Classification for Plasmon Assisted Microscopy	of Nanoobjects. No. 830, Technische Universität Dortmund, Fakultät für Informatik, 2010. Weichert/etal/2010b Weichert, Frank and Gaspar, Marcel and Zybin, Alexander and Gurevich, Evgeny and Görtz, Alexander and Timm, Constantin and Müller, Heinrich and Marwedel, Peter. Plasmonen-unterstützte Mikroskopie zur Detektion von Viren. In Bildverarbeitung für die Medizin, Springer, pages 76-80, 2010. Zybin/2009a Zybin, Alexander. Deutsche Patentanmeldung 10 2009 003 548.6. 2009. Zybin/etal/2009a Zybin, Alexander and Gurevich, Evgeny and Weichert, Frank and Niemax, Kay. SPR Detection of Single Nanoparticles and Viruses. In 4th International Scientific Conference on Physics and Control (PHYSCON), Catania, Italy, 2009. Gaspar/etal/2008a Gaspar, Marcel and Weichert, Frank and Müller, Heinrich and Musemic, Emir and Walzel, Peter and Wagner, Mathias. Signal-Processing based Frequency Analysis at Hollow Cones Nozzles. In Proc. of the Fifth IASTED International Conference on Signal Processing,	Pattern Recognition, and Application, pages 244-249, 2008. Mueller/etal/2008a Müller, H. and Biermann, D. and Kersting, P. and Michelitsch, T. and Begau, C. and Heuel, C. and Joliet, R. and Kolanski, J. and Kröller, M. and Moritz, C. and Niggemann, D. and Stöber,	M. and Stönner, T. and Varwig, J. and Zhai, D.. Success in Evolutionary Computation. pages 189-214, Berlin, Springer, 2008. Lokuciejewski/etal/2007a Lokuciejewski, Paul and Falk, Heiko and Schwarzer, Martin and Marwedel, Peter and Theiling, Henrik. Influence of Procedure Cloning on WCET Prediction. In Lokuciejewski (editors), CODES+ISSS '07: Proc. of the 5th IEEE/ACM International Conference on Hardware/Software Codesign and System Synthesis, pages 137-142, Salzburg/Austria, 2007. Landwehr/etal/2006a Landwehr, F. and Feggeler, D. and Walzel, P. and Weichert, F. and Schröter, N. and Müller, H.. A Fibre Sensor Based Frequency Analysis of Surface Waves at Hollow	Cone Nozzles. In Experiments in Fluids, Vol. 40, No. 4, pages 523-532, 2006. Falk/Marwedel/2004a Falk, Heiko and Marwedel, Peter. Source Code Optimization Techniques for Data Flow Dominated Embedded Software. pages 225, Kluwer Academic Publishers, 2004. Niemann/Marwedel/97a Niemann, Ralf and Marwedel, Peter. An Algorithm for Hardware/Software Partitioning Using Mixed Integer	Linear Programming. In Design Automation for Embedded Systems, Vol. 2, No. 2, pages 165-193, 1997.